Fresh water is essential to life, the environment, and to support productive activities, is not an infinite resource. It is unequally distributed by nature on the surface of the globe. Currently, 1.1 billion people; (17 %) of the population lack access to safe water while 2.4 billion people (40 %) lack adequate sanitation. The majority of affected people live in Africa and Asia. Furthermore, population growth, rapid urbanization, and economic development weigh heavily on water resources. In developing countries, water supply depends on large seasonal fluctuations (drought and flooding). Water reserves available in the earth’s surface are about 1.386 billion km3 (Detay 1997). The seas and oceans consist of salt water represent 97 % of global water stock and the remaining 3 % are inland waters (groundwater, glaciers, rivers, and lakes). Algeria has five watersheds with a total area of 2,243,229 Km2 comprising 19 catchment area. The renewable surface water resources are estimated at a total of 13.2 km3/year across the country. Water contained in the renewable groundwater aquifers in north of the country are estimated at nearly 1.7 km3/year, and these sheets are fed mainly by rainfall where the distribution is irregular in both space and time (NAHR 2010). Among Algerian watersheds, there those of “Constantinois” center coastal (northeastern Algeria) whose underground and surface water mobilized are around 354 million m3/year, a considerable amount but still insufficient relative to the growing demand for water by all areas (NAHR 2010) drinking industrial and agriculture water needs. The “Constantinois” central coastal (Skikda), with an area of approximately 4,138 km2, is part of “Constantinois” coastal watersheds (located in the North East coast of Algeria). Limited in the north by the Mediterranean Sea, in south by the wilaya of Constantine and Guelma, in east by the wilaya of Annaba and in west by the Jijel, and Mila wilayas (HBA 2010; Fig. 1). The study area has a population of 1,129,295 inhabitants (census 2008), which is densely located in big cities. Covering an area of 191,119 ha farm, the region is subject to a quite important demand for irrigation water. Industries are abundant, varied and highly concentrated around the town of Skikda (petrochemical pole). From the point of view climate, watersheds Skikda city belong to one of the wettest regions of the North East of Algeria, which is characterized by sub-humid to humid Mediterranean climate. Indeed, rainfall is very important in this region and its distribution is the most important on the well-reliefs where rainfall can reach 1,200 mm/year (Collo region), and decreases in the valley bottoms, but remains relatively high (800–900 mm/year) compared to other surrounding areas (Marre 1992). Superficial aquifers: formed by gravel and have permeability of 10–3 m/s and transmissivity that varies from 3.10–4 to 10–2 m2/s and the storage coefficient is estimated to 5.10–3 (Khammar 1980). Kebir West river for a length of 43 km and drains an area of 1,134 km2, with major tributaries: El Aneb and Fendek. Guebli river for a length of 38 km and drains an area of 944.6 km2, with major tributaries which are Fessa and Guergour (Titi Benrabah et al. 2009b). In this study, various bibliographical documents were consulted and exploited to establish a sufficient synthesis of knowledge. In addition to this, many trips to agencies and involved institutions (ANRH, ABH, MRE, DHW, ANBT, ONID, ADE,…) were done, supplemented by repeated surveys in the field of study. The establishment of surface water balance in the region has required the knowledge of parameters which determine the functioning of this system. Average values of climatic data for a period of 10 years were used for this study, which were drawn from the three chosen stations to better represent the whole field, based on criteria deemed necessary for the reliability of this study such as the existence of complete sets for the duration of our study, and their location in the three basins that form the area of study (Villa 1980). The underground water balance is calculated starting from the empirical formula. Actual évapotranspiration is the sum of the processes of evaporation and transpiration of water on a given surface and for a defined period is calculated by the formula of L. Turk (1961). Runoff is determined by the formula Tixeront Berkallof (Titi Benrabah et al. 2008, 2010). For the calculation of potential évapotranspiration, we used Thornthwaite formula, which is simply related to the action of climatic factors and do not involve the type of soil or vegetation, (Villa 1980; Titi Benrabah et al. 2006a). In the study area, for an average annual rainfall of 664.19 mm, the average runoff is 100.50 mm, évapotranspiration average is 345.52 mm (51 % of precipitation is evaporated) and infiltration is 151.50 mm, (Fig. 3; Marre 1992). The reserve easily usable reaches the maximum starting from December to April where depletion stocks begins (Raoult 1974). The CW Thornthwaite water balance has revealed an agricultural deficit which starts on May until September (Fig. 4; Lallemand Barres and Roux 1999). The surface hydric resources of the different catchments are mainly formed by the permanent flow of the three rivers, which carry an approximate volume of 481 mm3 (Titi Benrabah et al. 2006b, 2009c). These resources insufficiently mobilized by the four dams of the city, the rest flows join the Mediterranean Sea. In reviewing the (Table 1), we can see that the Kebir West river provides the largest contribution in surface water in the region with 58.62 % followed by the Safsaf river with 31.18 % then comes the Guebli river with 10.18 %, (Tesco-Visiterv 1982; Brennecke and Couture 2008). The wilaya of Skikda has four large dams in service with initial total capacity of 317 million m3 for water supply of the various districts, irrigation, and industry. Currently they mobilize only 292 million m3 due to siltation which caused a decrease in their ability to almost 25 % (JORA 2006). For 2010, Évapotranspiration recorded at these dams is almost 21 million m3. This phenomenon is more intense especially at the Zit Emba dam (10.56 mm3). Leakage at both dams Zerdazas and Zit Emba were evaluated to nearly 2 million m3 in 2009 (Table 2; NAHR 2010). The only desalination station in the region is that of Ben M’hidi with a production capacity of 10,000 m3/day. It currently produces an average of 3,000–3,500 m3/day ensuring the drinking water needs of Ben M’hidi and K’sob regions (1.27 M m3/year). Two other stations are planned for a production capacity of, respectively, 100,000 m3/day (36.5 M m3/year), and 50,000 m3/day (18.25 M m3/year). With their achievement, the volume of water produced will be almost 58.4 Mm/year, ensuring all water needs of the wilaya (Table 3; HBA 2010; CEAE 2006). The knowledge of an exploitable aquifer and its potential passes by the study of all its parameters (mass transfer, transmissivity, capacitive function, permeability,…) (ICPMS 1996). If the volumes are relatively well known, the flow passing through aquifers are much harder to be estimated because the distribution between the effective infiltration of runoff and flows is not known precisely. Thus, changing the resource is therefore very uncertain following in one hand climate change, and how to lead the operation in the other hand. The sub-soil of Skikda region is well provided with groundwater resources, even if all layers do not present important exploitable capacities (sheet sandstones and flysch aquifer in the valley of Safsaf). Alluvial deposits (Quaternary formations), formed along the rivers are the main store of groundwater in the region (Table 4). The preparation of hydro geologic sections supplemented by various geophysical surveys allowed us to bring into focus extension of the subjacent hydrogeological formations of the region of the study, their lithology and hydrodynamic relations between different layers (Fig. 5; Lallemand Barres and Roux 1999). The majority of potential underground water is pumped out from a battery of boreholes located in the alluvial plains of (plain Zeramna, Skikda, Tamalous, Collo, and Azzaba). Currently, on a total of 279 wells, only 127 remained in service and mobilize a total of 56.71 M m3/year 14 million m3 of them are distributed as drinking water supply Table 3. A commonly used indicator for determining the rate of exploitation is the ratio between the flows taken and those which actually pass through the aquifers (Fig. 6). The approximate volume of water infiltrated into the aquifers in the studied area is calculated as a function of infiltration (mm) and surface associated watersheds (Villa 1980). The gram bar represents the estimated exploitation rates for the major aquifers of the study area (Skikda), showing that at present (2009), the overall rate of groundwater exploitation is relatively low because it does not exceed an average of 10 % operating (9.54 % in the Safsaf valley 10.55 % in the Kebir West Valley and 1.74 % for the Guebli Valley. This situation (in groundwater resource exploitation) can be explained probably because of the use of surface water (water dams) in bulk instead of groundwater that has medium to poor quality in some boreholes as in Guerbez dune region and the industrial zone of Skikda city although the population density is high and in a steady evolution in this area and for groundwater resources that are henceforth insufficient to meet all its needs. Groundwater is best demanded for the point of view quality, because in most cases it does not require treatment once extracted, but in Skikda region, this type of water is sometimes threatened by the high rate of salinity in some wells, and polluted by various substances derived primarily from urban and industrial discharges and the leaching of agricultural lands (fertilizers). The abundance of surface water that are near 96 % compared to groundwater, which is only 4 %, although they are best demanded in matter of quality (chemical characteristics in relation to surface water), which requires no treatment after extraction (Table 5). This abundance is relative to waters above the river, because the total volume of 481 mm3, 292 mm3 is mobilized only by the four dams in the region near 1.47 million m3 and mobilized by the 12 dams, adding to the volume taken some of river water directly, the rest flows to the sea (Remenieras 1986; Miquel Revol 2002). Three major activities use nearly 70 % of the total reserve of mobilized surface and groundwater estimated at about 353.83 million m3 in the whole region. The first consumer is agriculture which uses about 112.77 million m3 of the total volume (2009), of which only 25 % is used by plants the rest returns to the water cycle (infiltration, évapotranspiration), (Marre 1992; Lallemand Barres and Roux 1999). Is the second largest consumption of water is drinking water of nearly 64.63 million m3 for year (2008) with about 30–40 % is lost because of leakage. The industry uses about 33.83 million m3 per year as freshwater, and almost 450 million m3 of sea water which present a total of 484 million m3 in 2010. In December 2010, the volume of mobilized water in Skikda region was about 353.83 million m3 for a population of approximately one million inhabitants. A volume of 64.63 million m3 (supply is distributed to the various Dairas in the wilaya). The estimate for 2,025 is 124.38 M m3/year. With a population increase to about 2 million inhabitants (almost the double the total mobilized and about nine times the volume currently distributed, USEPA 2005). The potential of the region in matter of surface and groundwater and soil are important in agriculture. It has allows the development of small and medium hydraulics and irrigation as the major schemes. The total water requirements for agriculture depend on climatic conditions, economic indicators in the region, and the increase in agricultural land (Miquel Revol 2002). It is among the most important cities in agriculture sector with an agricultural area (UAA) of 131,879 ha including 23,276 ha of irrigable land (Fig. 8). The total irrigated and equipped area in the study region is 9,698.25 ha for a volume of 46.99 million m3 of water extracted from different sources, was appropriate to staffing 5,000 m3/ha/year (CNRS 2004) (Table 5). The evolution of water requirements for agriculture is directly linked to the increase of irrigated farmland. In fact, projecting an increase of 5,000 ha every 5 years, the water requirements for agriculture will increase is as illustrated in the following diagram. Industries are concentrated around most important cities and their water consumption is extremely variable from one sector to another and despond the type and nature of the activity and the water quality (WHO 2008). This consumption is increasing because of socio-economic impact on the city. Water requirements for the various industrial units of the study area amounted to a total of nearly 33.83 million m3 in 2008 (water dams: 25.37 million m3 of water and drilling: 8.46 m3) (Table 6), and more, a considerable amount of sea water for industrial units that use this type of water estimated at 450 million m3 (Heathcote Isobel 1998). The analysis of the geological environment has shown that the field of study is largely formed by sedimentary fields seat in favor of water reserves and metamorphic field. Rainfall is very important, it can reach 1,200 mm, half of which is evaporated, 20–30 % is infiltrated, the rest is runoff (10–20 %). For an annual input of 481 million m3, only 292 million m3 are mobilized by four dams (Zerdazas, Zit Emba Guenitra, and Beni Zid) and the rest goes directly to the sea. A total of 127 boreholes mobilize a volume of 56.71 million m3 from major aquifers in the region (Safsaf, Kebir West Guebli), however, they remain undermobilized. 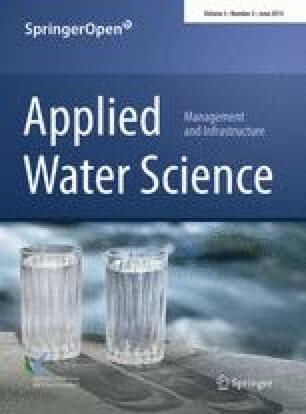 The three major activities that use water know an important development which implies a significant increase in water demand; drinking water supply uses about 64.63 million m3 per year where the estimate for the year 2025 is nearly 124.38 M m3, agriculture uses about 47 million m3 of total volume with an estimate for the year 2025 of 112.77 million m3. In the near future, changes in climate could create an unfavorable variance between the growing demand for water in different sectors of the region versus the available water resources. The impact of this factor should lead to a policy of sustainable management of water resources, in which the water should appear as a limited resource, a factor of production and a heritage to be preserved, thus to give the true value of water and its socio-economic importance.